But the real winner was a little girl called Nadine, the match having been held to raise money to send he abroad for medical treatment not available to her in the UK, and which raised over £500. Paul Abbott had with six feeder-carp for 47-10 as Gary Underwood netted a 15-12 carp (on single maggot) and enough bream to total 40-10, with Lee Jones getting 34-13 of bream and Pete Patton 32-12. Thirty-nine fished and organisers Paul and June Chapman were extremely grateful for help from Kevin Osborne and Steve Wright, and for raffle donations from Tackle Hub, GoneFishin and Pete Patton. 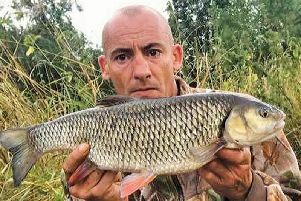 LOSING a good Furzton fish on a snag in the dark, Brandon Sunter donned waders and went in to remove it next morning...and ended up recovering a mountain bike. Then, determined to succeed, he got his baits back in the water and landed a 23-11. It may not be the biggest fish...but Paul Andrew's superb looking double from the cut in the north of the city is a really good omen for the canal. The original 1970s stock, mostly mirrors, have been fading away in recent years, but Paul's common is mostly likely to be one of several hundred fast-growing fish stocked by MKAA a few years back. STILL with carp, Paul Morton had a 22-9 from a Newport water while Lodge produced a stream of doubles headed by Russ Long's 21-12. FOLLOWING a number of fish deaths, plus a blue-green algal bloom, Ashlands has been closed to angling until further notice. OSPREY, Pidley: Ed Blane 100-4, Ian Millin 92-10, Bill Boyne 78-4. TOWCESTER/Nene, Stockton: John Balhatchett 59-12, Dave Gibbins 42lb, Les Goodridge 33lb. CALVERT, Itters Pit (silvers): John Hewison 23-8, Dave Lewis 18-14, Barry Witteridge 12-9. MK Vets float-only Ken Mott trophy, Furzton: Richard Lattimer 21lb, Martin Cunniffe 16-1, Simon Cordingley 14-8. TOWCESTER Vets, Stockton: Les Goodridge 14-11, Chris Howard 12-12, John Broughton 12-8. OLNEY open, Ouse: Pete Hawley 9-5 (roach), Dave Walsh 1-4-8, Dave Partridge 1-4. FURZTON Festival: Aug 22, Ken Ball (vets) 01908 565446; Aug 25 'float-only', Aug 27 Frank Swan open, Sept 14-16 carp open – GoneFishin 01908 313158. 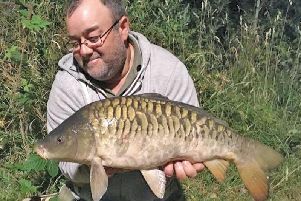 FIXTURES: Sunday, Abbey Pits open, 07795 068428; Aug 7 Olney Ouse open, 01234 240061.